This Equus compact hand-held OBD2 tool offers light do-it-yourselfers and consumers a quick & easy way to find out why the "CHECK ENGINE" light illuminated on 1996 and newer cars, light trucks, mini-vans and SUVs - foreign and domestic. This little tool packs a big punch with its patented single-screen display and system status LEDs for a quick check. Works on all 1996 & newer OBD2 Compliant Vehicles. "Plug & Play" Interface. Connects to the vehicle and shows all necessary data in 15 seconds or less - no set up required. Patented Single-Screen Display. 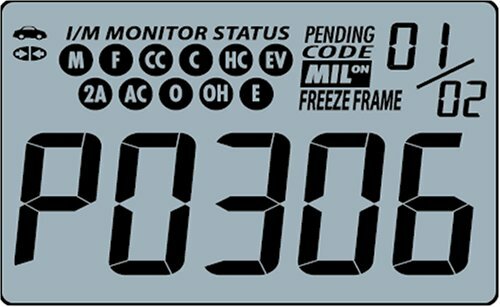 Patented all-in-one display shows 19 vital pieces of information, including diagnostic trouble codes (DTCs), pending codes, emissions monitor status and more (U.S. Patent #6,687,584). C.A.N. (Controller Area Network) Coverage. C.A.N. will be mandatory on all vehicles in 2008. It is the fastest way yet for OBD2 vehicles to speak with their computerized systems. Erases Codes. Lets the user turn off the "Check Engine" light, clear codes and reset monitors. Booklet and CD. Includes manual with DTC definitions in English, French & Spanish. Support. Includes free Understanding OBD2 video and support by all ASE Certified Technicians via toll-free phone line or Internet. System Status LEDs. Color-coded LEDs show quick emissions readiness status. This is great to use before getting an annual emissions "smog" check, buying a used car or taking a long road trip. Read trouble codes in a snap. See product details. the cause of "Check Engine" light warnings on any 1996 and newer car, light truck, or SUV--foreign and domestic. The tool features a unique, patented all-in-one screen display and an LED display for quick emissions status checks. Meanwhile, the 3030's automatic refresh updates data every 30 seconds when connected to the vehicle, offering an easy way to verify repair completion. The tool communicates with all OBD II protocols, including CAN (Controller Area Network). It works, and it really save you money and time!!! This device works as advertised. I used this code reader to perform a diagnosis for my brother's car due to the Check-Engine-Light came on problem. I researched the Error Code on Google, and found out it was because the coolant temperature sensor recorded a figure outside its range on a very cold winter day. I didn't considered the sensor was failed because the thermometer was working fine. I checked everything of the car it showed nothing unusual. I erased the error code on the car's computer system. It has been more than five months since then. The Check-Engine-Light never come on again. Just one diagnosis I already got the money back. Excellent product, what I like most is that there are no batteries required for these devices they draw power from the vehicles electrical system. Recently the "Check Engine" light illuminated on the dashboard of my 2002 Volkswagen Jetta TDI, and I used this as an excuse to purchase a code reader. I chose the Equus 3030 based on price, richness of user interface, and sophistication of the company's website (Innova). I was not looking for a high-end tool, with battery-backed up memory and an internal list of code descriptions. Ideally, I will seldom use this tool, and using the manual (or even better, the company's website) to look up codes works fine for me. So I have to write down the code on a piece of paper, and take that to my computer, rather than the unit remembering it for me. Plus, no batteries to go dead while the tool sits in my toolbox. I did appreciate the extra indicators on the LCD display, and the Green/Yellow/Red LEDs for quickly checking the status of the system. Other inexpensive code readers have a single line of text displayed, with very little else, and you need to scroll around to get information. With the Equus 3030, icons are displayed to indicate which tests have run, or have not returned good status. Also, a count of codes, pending status, and the status of the check engine light are all displayed along with the code itself. The CD included with the unit is designed for Windows users. However, it contains the manual in PDF form, plus an instructional video that played just fine on my Mac. I cannot comment on anything else on the CD, but it's certainly not required to use the tool. And as I mentioned, code lookup can easily be done on the Innova website, with the URL printed on the front of the tool. I have the hope that they will keep their database of trouble codes up-to-date, which is often better than software on a CD. I was able to plug the tool in to my car's OBDII connector, turn on the ignition switch (without starting the engine), press the "link" button, and in seconds had a code displayed. I noted the code, and looked through the user manual. Unfortunately, they only list common codes in the user manual, and didn't have my code. So I typed it in to the search box on their web page and found that I had a fault in my #2 cylinder glowplug. It was a simple test to verify that (check the resistance of each plug), and indeed that was the fault. I have glow plugs on order, and will replace them myself on the weekend. This unit has been working fine, doing as expected to do. I bought this product thinking it will work on my 2005 SUZUKI, but i was wrong. It reads error. It works on my American made cars thou. I emailed the manufacturer, and send the registration card as well, but no response back from them whatsoever. I got this to diagnose a 1998 Honda CR-V that was giving a 'Check Engine Soon' light, that I had just bought. It came with in a couple of days as advertized. The instructions did not work quite as described: with ignition off, it came up immediately with 'read' indication, then Err1. To get it to work on this car, plug it in, ignition off, and turn ignition on within a couple of seconds. It diagnosed a problem (misfire on cylinder 4), and enabled me to clear the DTC. Unfortunately, the problem is intermittent, and comes back every couple of days. The dealer says he can't do anything until it is a hard error and comes up every time in a test drive. At least the Equus allows me to clear the DTC (does not affect driveability) and check if it is a new code. If you belong to the first category, why are you reading this? If you belong to the second group, and you have a basic knowledge on car repair, read on. All the new cars now have many sensors, it is basically impossible to fix your own car unless you have a OBD2 code reader. The reader will tell you what the problem is, but it will not tell you how to fix it. The Equus 3030 is a good basic OBD2 code reader. I found it works perfectly on my 2002 Chrysler. I plug it in, it tells me the code, I look up the instruction manual, and I know what is the problem. In my case, it was code P0340 Camshaft Position Sensor. My next challenge is to figure out where the Camshaft Posistion Sensor is located. The company web site does not give instructions on how to fix the problem. After an hour of searching on the internet, I found a web page showing me a picture of where the sensor is located, what it looks like, and many other technical information about the system. The rest was easy, buying the sensor cost me $50 and took me an hour to install. Then I use the Equus 3030 to reset the OBD2 code and turn off my yellow check engine light. I found the Equus 3030 to be an excellent unit for occassional users like you and me. The other more expensive units does have some more features, but they are really not needed for the weekend car mechanics. The unit is compact (remember you have to store this unit for a couple of years before you use it again), well constructed, and does what it said. Some other users comments on incompatibility with Subaru and VW. I don't know if it is still a problem, but the comments are old, and I hope the company has fixed the problem. Works fine.. Does not reqiure a battery in the reader. it runs off the vehicles battery..
Easy to use and has code in book and is a simpler verison then the more costly ones. Easy to use and worth the price! I just got it w/ the 2 day shipping option since my garage wanted me to spend a ton of money to find out which O2 sensor went bad (I have 4 on my F150!). I got it in the mail Fri night & used it Sat am. so I could get the truck fixed up for my next emmissions test on Monday. The unit came up w/ the same code as the garage and it also tells you if any other systems are in need of repair- It will NOT fix it for you, you will still need to be mechanically inclined to be able to actually fix the problem. I also used it to turn off the my dash 'engine check' light and also used it on my ex's jetta to view the MAF sensor problem & turn off her dash light as well.